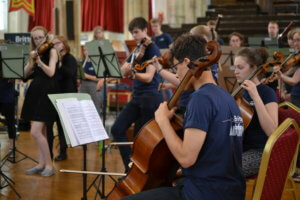 Britten Sinfonia Academy met on the weekend of the 22nd-23rd September for the first time since their audition process. They are already making fantastic progress after only two days of playing together. Lead by Alexandra Caldon, one of Britten Sinfonia’s violinists, the Academy got started on some Milhaud, De Falla and Ligeti, as well as beginning to learn the basics of communication and leadership, vital skills that make chamber music so exciting. BSA have a number of performances over the course of the academic year, including a musical trail around some of Cambridge’s museums and taking centre stage in the fourth At Lunch concerts of the season in Norwich and Cambridge. In addition to the orchestra, there are currently three young composers who are members of BSA’s Composer Hub who are being mentored by composer Edmund Finnis this year. Edmund’s new work for piano trio will receive its world premiere during At Lunch Two. The composers spent the day learning about composition for folk instruments and discussing folk-based techniques, in addition to showing Edmund a recording and a score of one of their pieces and receiving guidance on how to develop their work. 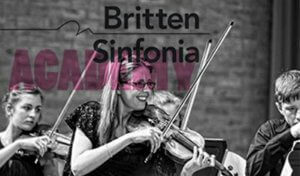 Over the course of the academic year they will write for Britten Sinfonia Academy, and will have many opportunities to workshop their pieces – a crucial way of learning about players’ abilities, and instrumental capacities. This sort of opportunity is extremely precious, and working with Edmund for the rest of the year will no doubt result in excellent student compositions and experience. Meanwhile, the instrumentalists started the day with a warm up, moving on to tutti (whole orchestra) rehearsals and had sectional rehearsals as well. Players particularly enjoyed their sectionals, where they spent more section- and instrument-specific time working on trickier bits with mentors from Britten Sinfonia. In this introductory weekend, BSA started working on the repertoire that they will perfect by the time Project Four and the final concerts come around. They worked on Darius Milhaud’s Le Boeuf sur le toit, a surrealist ballet strongly influenced by Brazilian popular music. Technically and rhythmically challenging, this piece was obviously very much enjoyed by the students and is sounding fantastic already on very little rehearsal. The Academy also got their teeth into Manuel de Falla’s The Three-Cornered Hat which is also a ballet set to music, as well as certain movements of Gyoergy Ligeti’s Concert Românesc, which reflects Ligeti’s love of Romanian folk music. By Sunday late afternoon the improvement compared with Saturday morning’s rehearsal was extraordinary to witness. This year, BSA are focusing on folk-inspired, very characterful music which links into Britten Sinfonia’s OPUS2018 competition for unpublished composers, and its accompanying At Lunch Three concerts. Additionally, in line with this folk theme, Project One for BSA will focus on improvisatory techniques, working with folk musicians Rob Harbron and Emma Reid. When Britten Sinfonia’s Creative Learning Director, Sarah, explained the projects and events that are still to come, the room filled with hushed, excited whispers, particularly at the mention that Sir Mark Elder will also be conducting a rehearsal with the Academy! It’s going to be a great year. Britten Sinfonia Academy will perform throughout the year, and for more information on Project Three featuring BSA having residence in three Cambridge Museums for the weekend, click here. You can book tickets for At Lunch Four featuring Britten Sinfonia Academy in July 2019 now.